Inaco are suppliers of automation equipment, industrial controls, and health and safety equipment. They now stock a range of safety signs from Brady. Brady’s range of health and safety signs ensures that employees and visitors can clearly identify potential hazards. 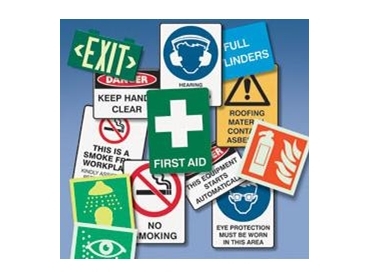 The wide range of signs include Danger, Mandatory, Prohibition, Warning, First Aid, Hazardous Substances and Fire Equipment signs made from various materials such as Self Adhesive Vinyl, Polypropylene and Metal. Inaco can also custom design signs to meet exact specifications. Brady’s single-sided polypropylene signs are now manufactured using a majority of recycled material. They are constructed using at least 50% recycled polypropylene that is bonded to the rear of virgin-grade sheeting and subsequently printed on. This process ensures that the signs maintain a high quality, crisp, white finish. The recycled material uses 97% less energy than virgin grade throughout the manufacturing process. This means significantly less carbon emissions.